"Special chairs" fall into two categories. Firstly, those that won't fit into either the ladderback or spindleback categories, . 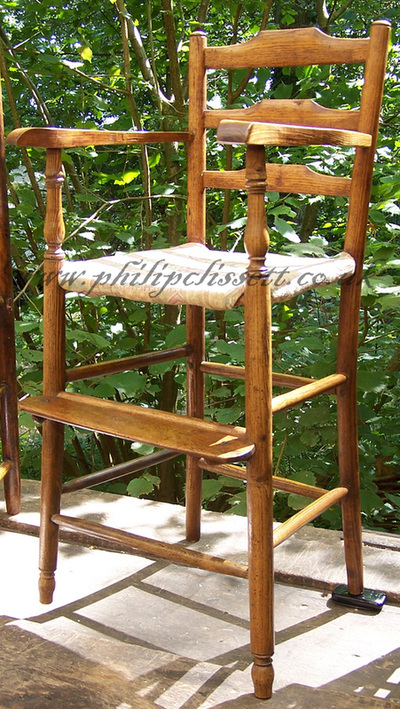 Even the existence of a single odd chair, stamped with Philip's initials, should alert us to the possibility of more. 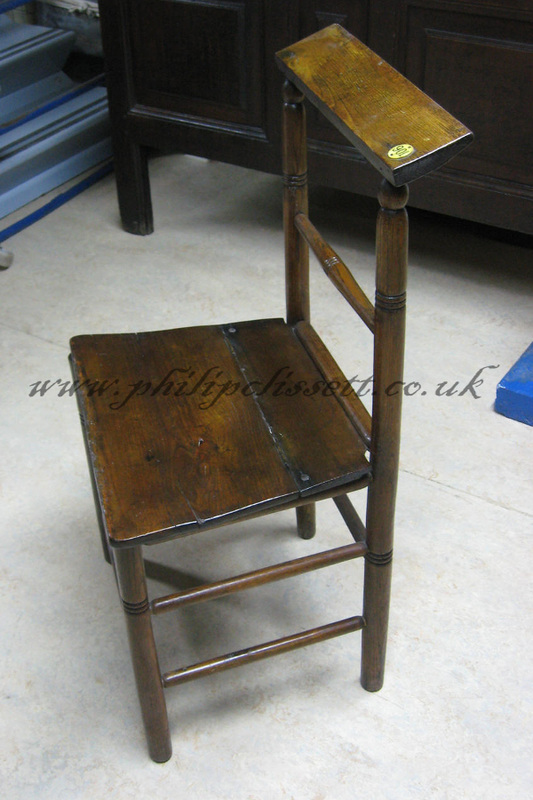 This category includes a stool attributed to Philip Clissett. The second category embraces chairs made for children, either scaled-down versions of adult chairs, or high chairs that allow infants to sit at table (these are sometimes called "table chairs". This chair belongs to the Hereford Museum; I am indebted to them for allowing me to examine it. Essentially, it is a metamorphic chair. With the flap seat down, it is a conventional chair. With the flap up, and with the missing kneeler piece replaced, you could kneel at prayer, resting your arms on the sloping top rail. 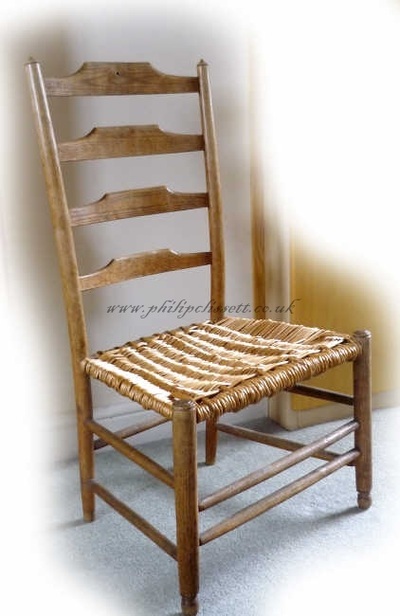 While the construction of this chair is based on Clissett's standard frame, the extensive modifications indicate the degree to which he was willing to adapt to a customer's requirements. 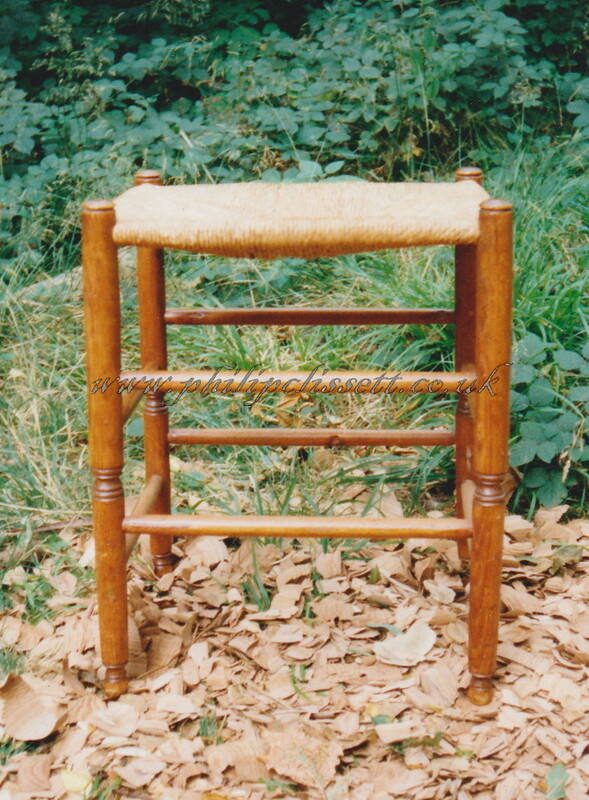 The chair is known to be by Clissett because his initials are stamped on the tops of both front legs, and its construction is compatible with his workshop practices. The Museum has an identical chair which is unstamped. Note numeral plaque attached to the top rail, suggesting that there may have been more of these chairs in some hall or other meeting place. The origins of this chair are unknown. If anyone knows where it came from, or where there are any others (stamped or not), then please let us know. Known only from a single photograph taken by Bill Cotton, who was assured it was by Philip Clissett. The turnings at the top and bottoms of the legs are identical to those on Clissett's later ladderback side chairs. 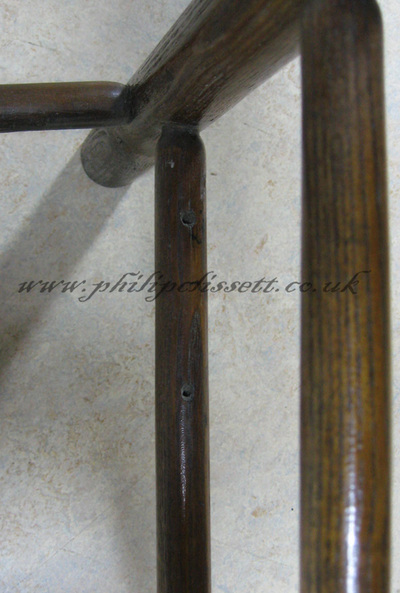 The central turning is similar, but not identical, to the decorative turnings found on some of Clissett's spindleback side chairs. 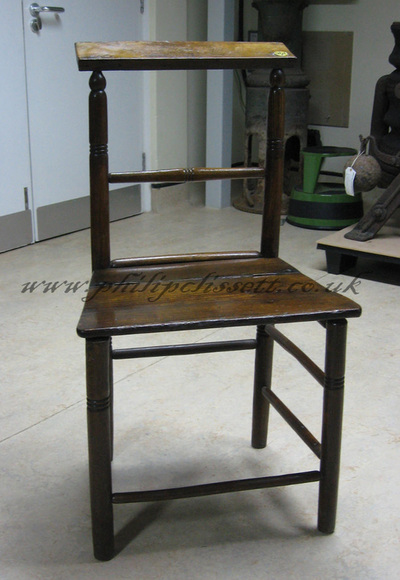 The stool certainly looks like Clissett's work, but without inspection or detailed provenance, I couldn't be certain. It's included here to alert readers to the possibility of stools by Clissett, and to appeal for information. If you have any, please ﻿contact us﻿. 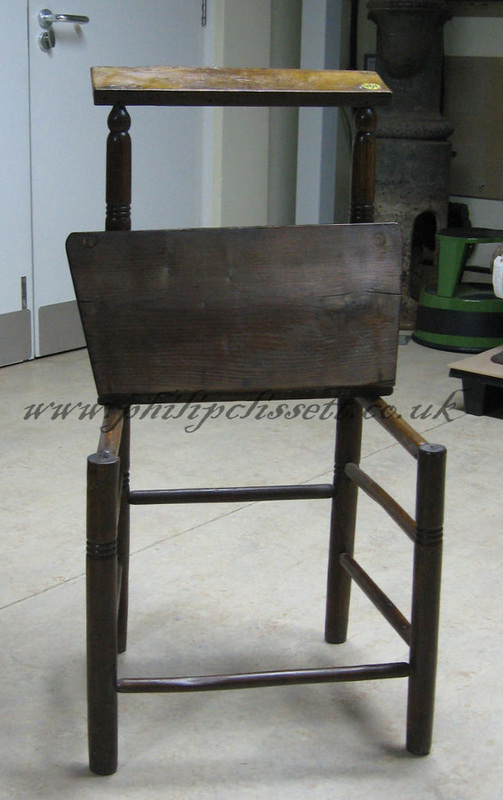 Children's high chairs made by Philip Clissett are very rare - only three examples are known. While one seems to be a straightforward adaptation of the ladderback armchair (no 1 above), the other two are interesting mixtures of design elements. 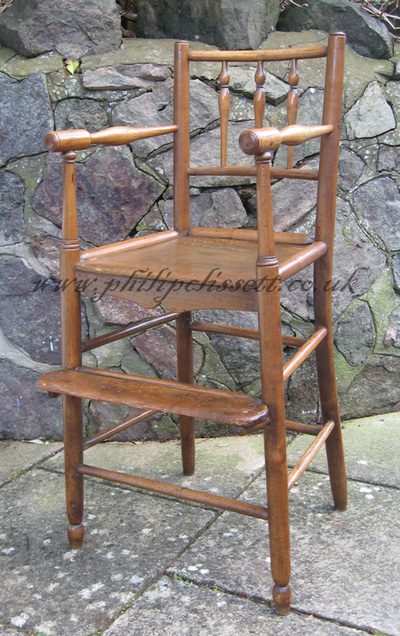 We have a ladderback chair (no 2) with the front leg design of a simple spindleback side chair, and the under-arm support from a spindleback armchair (miniaturised, of course). The other is a spindleback elm-bottom chair (no 3) based on Clissett's simple dowel-railed design, but with the tapered under-arm support of a ladderback armchair, and a unique (to Clissett) turned arm. 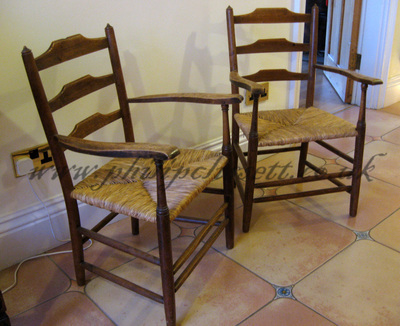 The latter two chairs are stamped with Clissett's initials in the usual way. The first ladderback is unstamped, but attributed to Clissett because of workshop scribe marks and other attributes typical of Clissett's work. 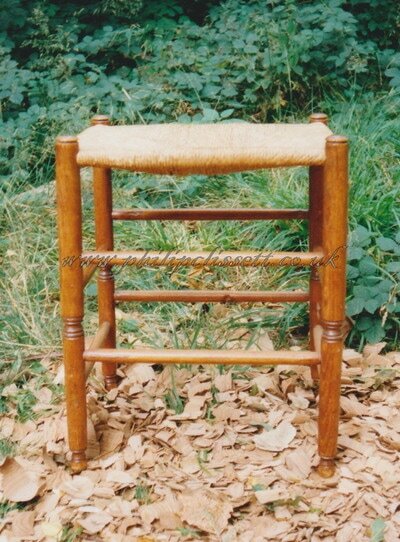 This chair is now in the collection of the Museum of Childhood. The other two are privately owned, and I have to thank Sally Horsnett and Ray & Liz Hunnaban of Miscellany Antiques, Malvern for allowing me to examine them. 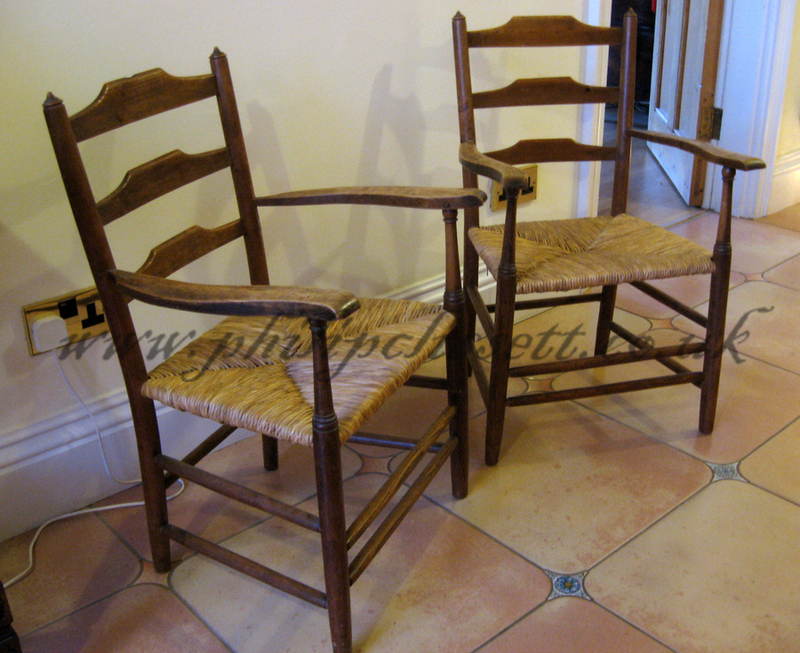 Miniature versions of Clissett's standard three-rung ladderback armchairs exist but, like the high chairs, these seem to be rare; only one pair is known. These have very good provenance, having been ordered from Clissett, and still in the same family. 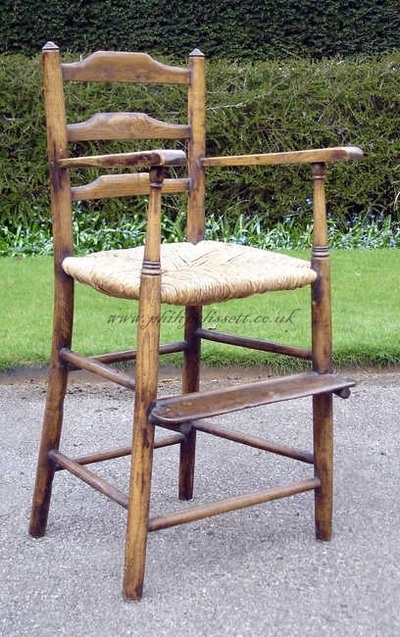 A single four-rung side chair is also known. Another pair is recorded, and was shipped to New Zealand. The three children's chair that have been examined are scaled at 85% of the standard adult chairs, with a seat height of about 14¼ inches (compare with about 16¾ inches for adult chairs).